A knowledgeable home mechanic or professional technician can carryout the majority of their work with basic hand tools. 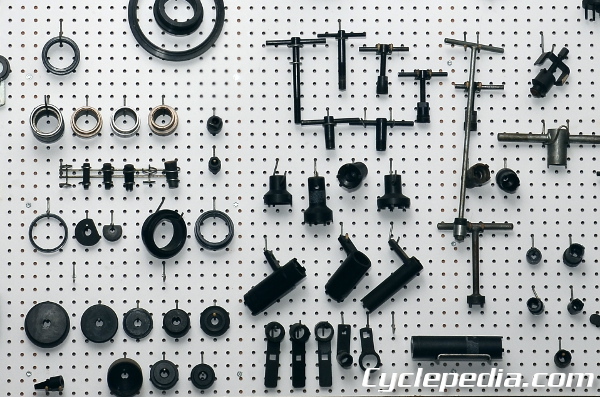 A major dividing line appears when the service manual calls for the use of a special tool. The professional technician should have a large selection of special tools for handling specific jobs. Even a crafty shade tree mechanic can be stonewalled without the correct special tool. 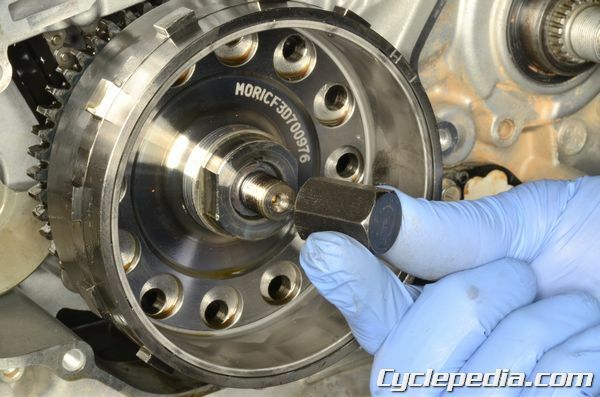 A flywheel puller is needed to free the magneto flywheel on almost all engines. 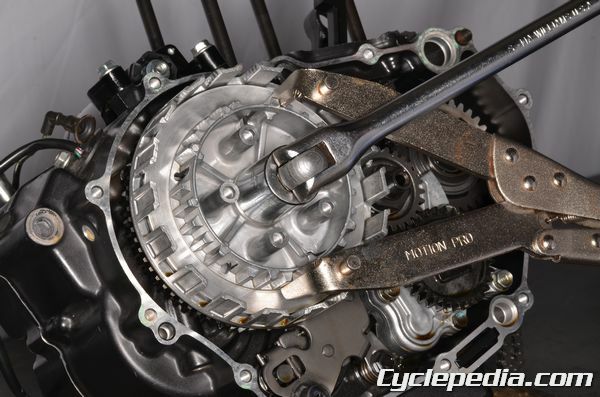 A similar crank or clutch puller may be required to remove or installed CVT pulleys or crankshafts. Flywheel pullers come in many different configurations. At their most basic they may just be a large hardened bolt, while others may have multiple components that need to be used together. Carefully select the correct puller to prevent damage and wasting your time. 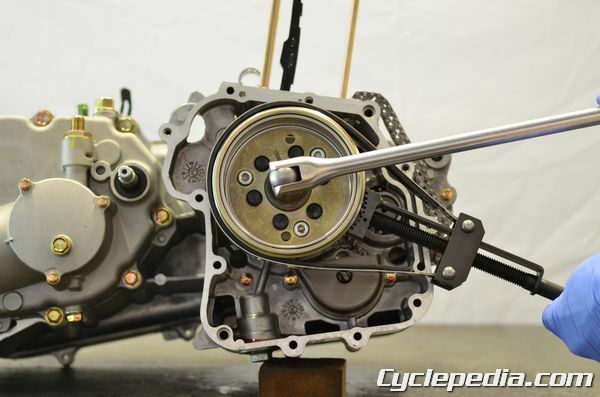 Grease the threads when using hardened steel pullers. Also, take care to protect threads when using these tools. Thread protector attachments are often included with the special tools from the factory, or labeled by part number in the service manual. 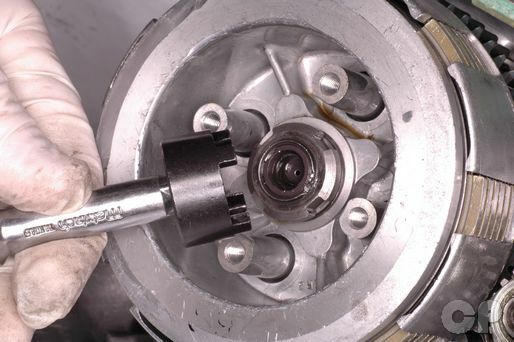 Special holding tools are needed to hold rotating components so their nuts or bolts can be loosed or tightened. 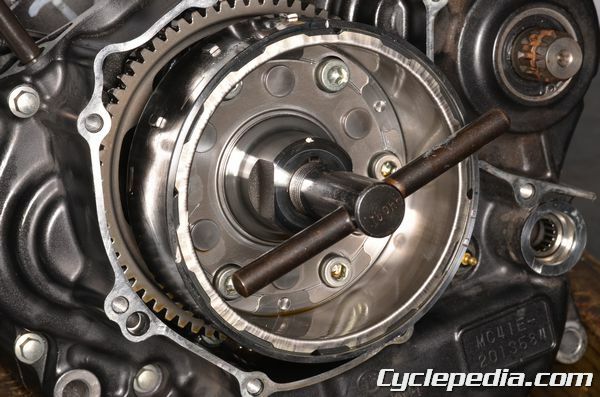 Universal clutch holding tools will work for most clutches, but sometimes a specific tool is required. CVT pulleys and flywheels also require holding tools for loosening and tightening fasteners. 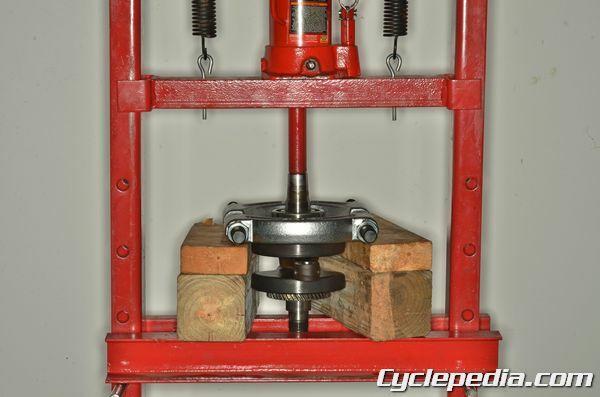 Flywheels can held with a strap type holder tool, but make sure to avoid damaging pickup projections. 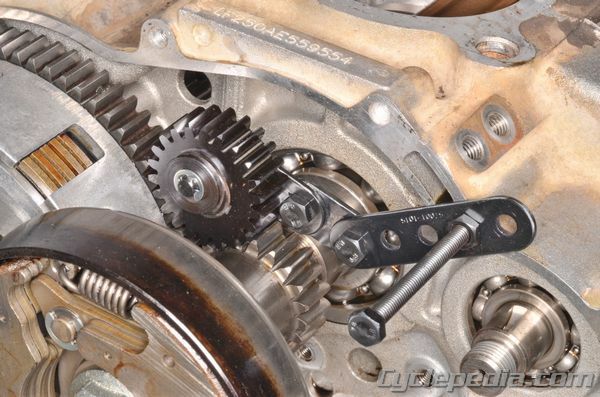 Gear holder tools are often required to lock up turning parts to loosen and tighten fasteners. 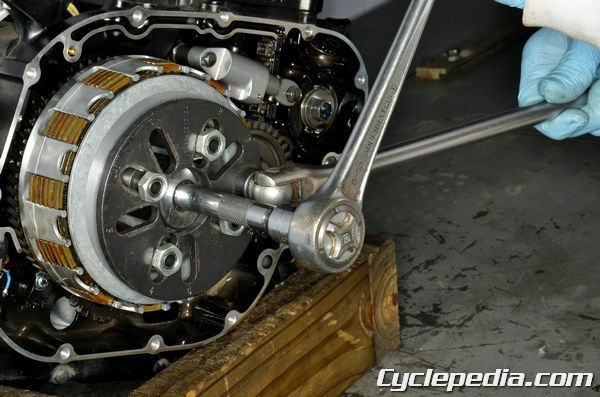 Some individuals may try and get by with a folded rag or a penny between the gears, but be warned these improvised gear holders can fail with damaging consequences. Castle nuts are fairly common in powersports vehicles. Having a large selection of castle nut wrenches and sockets comes in handy. 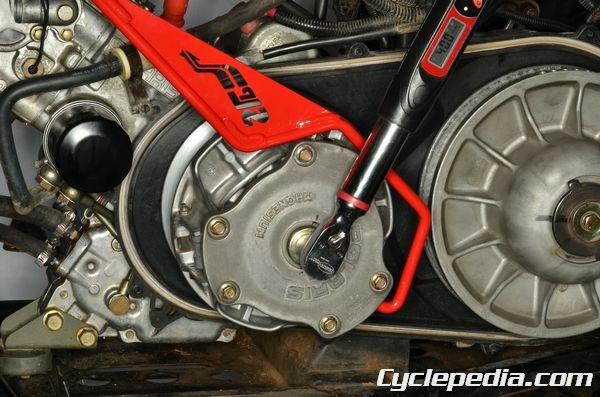 Cutting down an old socket to try and get by is time consuming and in the end it may not hold up to the required torque. 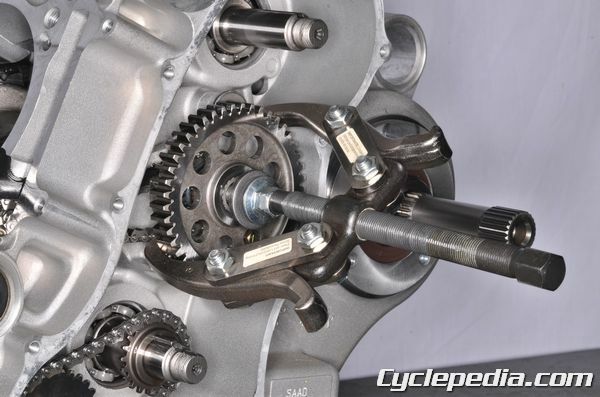 Inner lock nut wrenches are often needed to remove shafts in drive train components. Usually there aren’t work around for these fasteners. Without the tool the nut isn’t coming out. A well equipped shop should have a variety of universal pullers, split bearing pullers, blind bearing pullers, bearing drivers, and a press. Have respect when working with a special puller tool or a press. These devices are very powerful and can easily damage components. Work carefully and anticipate the movement of components to prevent doing more harm than good. A special tool is usually not used everyday, but this doesn’t mean it should live in a box in the bottom of a storage closet. The special tools should be displayed, not to show off, but so they can be organized by type and a technician can find what’s needed quickly. 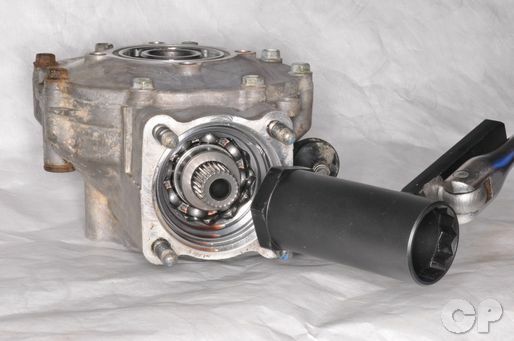 Like the old saying, “Out of sight, out of mind.” If the tools are hidden away one might forget the tool is already in the shop, and another expensive tool may end up getting ordered or fabricated unnecessarily. Also, special tools often must be shared between technicians so a common storage area is required.